When my office moved from Yaletown to Gastown, getting to Anatolia Express for lunch became much easier and more convenient. This hole in the wall is an offshoot of the popular Anatolia’s Gate in Burnaby and as a result had been on my list of restaurants to try. As soon as I stepped through the door, the woman running the small eatery greeted me warmly. She had a very kind face and instantaneously you knew you would be taken care of here. On my first visit I watched her diligently put together my take out order. By being situated at the New Vancouver Convention Centre, Anatolia Express is a bit of an underdog pitted against Cactus Club, Rogue Wet Bar and Mahoney & Son Pub. As I waited for my lunch, in my heart I was rooting for her food to be fantastic. There’s something about cheering for the little guy, especially when they are so likable. 80% of my first entree was a “Wow” for me; unfortunately the remaining critical 20% was a bit underwhelming. However, what made that last portion below average was easily correctable. At that time, I knew I could not in good conscience write a “Wow, you got something there!” post for Anatolia Express. Hope springs eternal sometimes; and the food at Anatolia Express was so close to being fantastic! Over the next 4 months, I would check up on them in hopes they could correct that one thing that would make their fare so much tastier. Each time I went, the friendly women charmed me further in how she would patiently explain Turkish fare to inquiring customers, or how she greeted customers with such kindness. Finally, after my first visit in March, Anatolia Express adjusted the one thing that prevented them from being a great eatery in mind opinion: they started seasoning their meat more aggressively! Everything else that was served was delicious. However if you order a Lamb Kofte entrée, the protein needs to be executed as well as possible since it’s the star and cannot be bland. The reason I am so adamant about the seasoning is when salt (in appropriate amounts) is added to a meat mixture it emboldens the flavours of all the other ingredients and spices in the concoction. Adding salt on top after it’s already cooked doesn’t have the same effect as its incorporation in the food before cooking. After 2 consecutive visits, where the meat was salted and spiced wonderfully, I can write in good faith about the tastiness that can be found at Anatolia Express. The 3 salad sides added flavor to the meal but also balanced out the ensemble. In particular I was impressed with the restraint of using seasoning on the cucumbers because unadorned it provided a freshness that may not have been possible if dressed. A small Turkish pide was served with the meal and it reminded me of mini football. The bread, made with whole wheat flour and topped with black and white sesame seeds, was aromatic, soft but robust. It’s wasn’t a flimsy piece of pita bread that’s for sure. 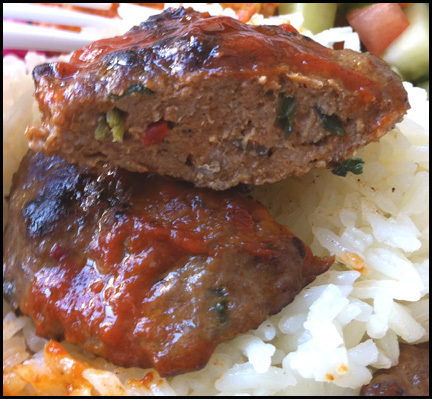 The Lamb Kofte, is topped with a tomato based sauce that is savoury. The little lamb patties had bits of parsley and chili flakes. I could detect a faint smell of lamb with eat bite. The mixture was salted well, tender and I tasted a sweet bell pepper flavor (perhaps paprika?). The meat and sauce went very well with the slightly salted and buttered medium grain rice. Admittedly, there is a rather large bias in this review. Honestly, I can say I gave more opportunities to Anatolia Express to shape up than I would normally afford other restaurants. There was just something about owner. Her face just exudes a happiness that is so endearing, you just feel good about have a meal there. 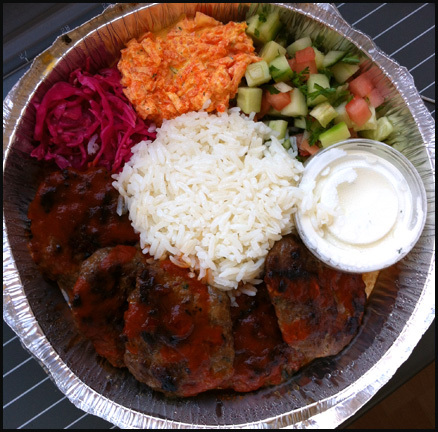 I do find the Lamb Kofte very tasty and I stand by my opinion. However, this bog post speaks to how important the demeanor of an eatery’s staff can be to its success. People are more forgiving if you are genuinely warm and friendly as oppose to surly and indifferent. So if you want something that is more rustic and hearty than the stylized plates you can find near the Convention Centre, please give Anatolia Express a try.